Life's amazing sometimes and really hard sometimes, there are moments of loss and grief, when things just don’t go the way we thought it would have been. There are times when the family members love each other, and there are times when they struggle to communicate effectively. Those moments can make families confused, frustrated and sometimes clueless. 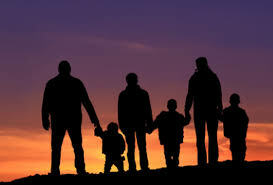 Counseling is a completely different experience for every individual, and what happens in your sessions will depend very much on what you hope to get out of it, and on the unique needs of your family. Families can be a source of understanding, supporting, encouragement and love but sometimes relationships within families are put under stress and family members feel isolated or overlooked. Our Profesional Counselors will help the family recognize their patterns, build on strengths and develop alternatives, providing all family members a voice in the process. First, the therapist will communicate to everyone in the family to help understand what's going on. They'll ask questions about how each person views the problems, when the trouble started, and how the family has been trying to manage things so far. Next, the therapist will work out a treatment plan. The goal is to improve conflicts in a family & not to blame each other for the issues.Your therapist will help family members communicate better, solve problems, and find new ways to work together. Family therapists can't always make a problem go away. But it can give family members new skills to get through difficult situations in healthier ways.